Background: Conversion to open surgery occurred in 12-29% of the patients who underwent laparoscopic colorectal resection. 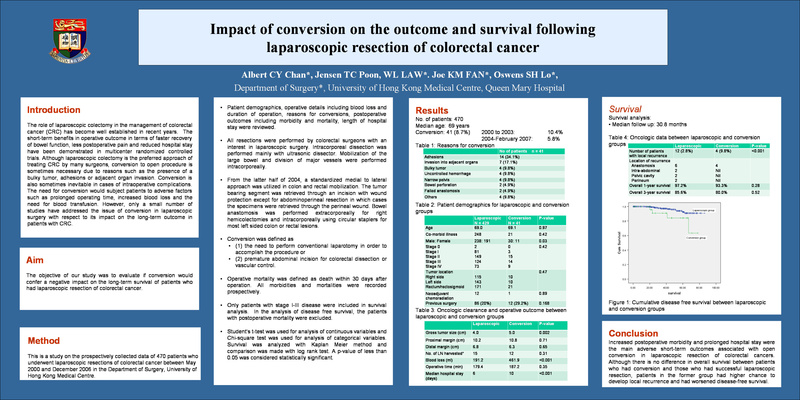 This study aimed to evaluate the impact of conversion on the operative outcome and prognosis of patients who underwent laparoscopic resection for colorectal cancer. Methods: The prospectively collected data of 473 patients who underwent laparoscopic colectomy between May 2000 and December 2006 were analyzed. Patient demographics, operative details, postoperative complications and follow up data were collected prospectively. Conversion was defined as the need for an unplanned incision to complete the attempted laparoscopic procedure due to patients’ factors, tumor factors as well as intraoperative complications.